Today’s Warsaw (Ind.) Times-Union includes a story about Grace Brethren International Missions honoring several individuals for their 50 years of ministry. Honored were Tom and Doris Julien (pictured at right), who served in France and also have served in administrative roles in the U.S.; Bill and Imogene Burk, Brazil; and Jack Churchill, deceased Jan. 8. To read the complete story, click here. WINONA LAKE – Grace Brethren International Mission staff, along with local community and church leaders, gathered Wednesday to honor those who served the mission for 50 years or more. 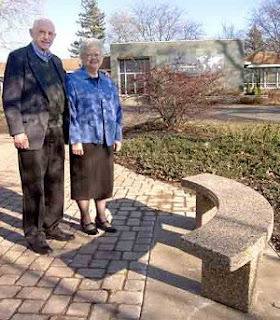 In the garden in front of GBIM’s International Missions Center, the mission placed two benches with the names of those who have served for 50 years and a pillar with a plaque the mission hopes will inspire young recruits. Those honored were Tom and Doris Julien, Warsaw; Bill and Imogene Burk, Brazil; and Jack Churchill, deceased Jan. 8. The Juliens attended Wednesday’s celebration and the Burks and Churchill’s widow, Rosa, were reached by telephone. You folks are certainly worthy of being honored for your faithful service to the Lord. It's a privilege to know you.